Der Artikel John Scofield (geb. 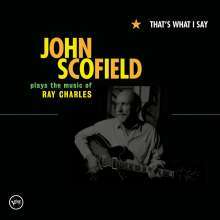 1951): That's What I Say: John Scofield Plays The Music Of Ray Charles wurde in den Warenkorb gelegt. + Dr.John, Aaron Neville, John Mayer u.a. The 13 tracks on That’s What I Say range from lesser-known Charles gems to some of his most signature tunes. However, Scofield crafts each tune in his own distinctive style, putting his indelible stamp on every performance. Scofield, a fan of Charles’ since childhood, showcases his well-known guitar mastery as well as his strengths as an arranger and interpreter of song throughout the tribute, particularly in his inventive horn arrangements. Scofield’s core group for this album features Steve Jordan (Sonny Rollins, Rolling Stones), the album’s producer, on drums, Larry Goldings (Maceo Parker, James Taylor) on keyboards and Willie Weeks (Aretha Franklin, Stevie Wonder) on bass. Scofield leads these stellar musicians, creating the solid groundwork for a star-studded guest list as they pay homage to Charles. Scofield made inspired choices when inviting these collaborators to join in on this recording. Dr. John brings some N’awlins soul to the medley “Talkin’ Bout You / I Got A Woman,” while Warren Haynes of the Allman Brothers, Gov’t Mule, and The Dead takes on “Night Time Is The Right Time.” GRAMMY®-winning pop star John Mayer showcases the breadth of his talents by singing and playing guitar on “I Don’t Need No Doctor,” and Aaron Neville’s inimitable voice elevates “You Don’t Know Me.” David “Fathead” Newman blows smoldering sax solos throughout, and the incomparable Mavis Staples leads “I Can’t Stop Loving You” deep into the blues. S. Richter in Stereo 7 / 05: "Die Grooves sind unschlagbar, die Gastsänger und -sängerinnen inspiriert - Kurzweil ist das Gebot der Stunde." R. Dombrowski in stereoplay 7 / 05: "Dieses Album ist ein Glücksgriff. Es ist beseelt vom Geiste des Mentors und führt dessen Idee produktiv fort, ohne ihn zu kopieren. Der Clou aber ist das Defilee der Gäste, die Scofield zur Seite stehen."